This post was sent to me by a friend who has been similarly outraged by the recent happenings in the legal market. 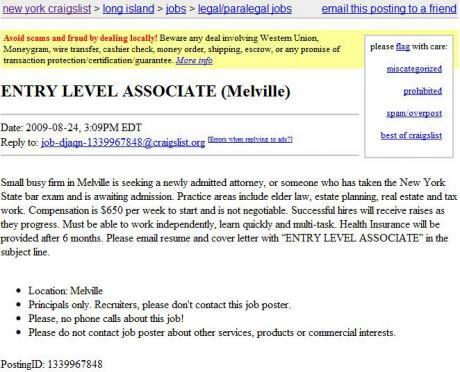 Currently lawyers in NY collecting unemployment likely receive $405 + $25 or approximately $430 a week. The above position boasts a lavish salary of $650 a week to a population whose average educational debt (just for law school) is $76,763 not to mention many have undergraduate loans that raise this average to $150,000 or more. The yearly after tax pay for a New York City resident collecting unemployment will be: $17,348.22. The yearly after tax pay for a New York City resident for the above job will be $25,026.39 (paycheck calculator). $7, 685 + Experience for 1 year’s worth of legal work versus the risk of not keeping legal skills fresh during potentially long periods of unemployment but retaining the ability to find a job that lets you maintain your self worth and allows you to feel like a respectable human being when going to work each morning because it pays a reasonable value for your services and skill. Maybe this is my downfall but given this choice I will always chose the latter. Payscale.com claims Lawyers with less than 1 year of experience make $45,000 to $69,000 (across the entire US). This is vastly divergent from my observations. I have yet to see a post for a junior/entry level Attorney for over 35k (that does not require the attorney to be currently employed or require several years of nice legal experience). There are next to no jobs available and the ones that are, are from firms/solo practitioners doing everything in their power to offer rates vastly below market (especially in NY, which is ironic because this is where legal jobs tend to cary a slightly higher premium due to the outrageous cost of living).